The glorious mountain peaks and vast expanses of untouched wilderness that visitors to Glacier National Park each year are certainly a reason to celebrate our freedom and independence. What better place to do so than, here, the home of many majestic bald eagles, the very symbol of American freedom. With four lodge rooms and twenty-six private cabins we provide lodging for visitors to the Glacier National Park area all year round along with an on-site restaurant, saloon and espresso bar open to all. Located on six acres of land that borders the Flathead National Forest, we are a quick eight miles from West Glacier, the Amtrak station and the West Entrance to the Park. Family-owned and operated, we pride ourselves on our mountain hospitality and our goal is to make all our guests feel right at home with first-hand knowledge of the Park and surrounding areas, local activities, and a genuine interest in their goals for their vacation and the memories they make along the way. One of our favorite annual events is the Fourth of July, and our annual firework display has grown each year to become a full-blown pyrotechnic extravaganza for both guests, employees and local families. Our legendary annual firework display begins at dusk with a special display for the youngest members of the family before reaching a crescendo of colors against the big Montana night sky. There is no fee to attend this event and all are welcome. Bring your lawn chairs and a blanket and enjoy the sparks and great company! 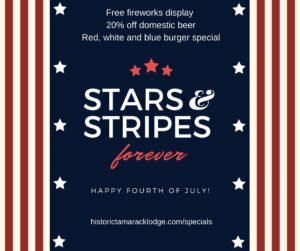 The restaurant will be open with a full menu and celebrating with a delicious red, white & blue burger special oozing with caramelized red onions, crumbly blue cheese and smooth swiss. Over at the Saloon, you can save with 20% off all domestic beer. We’re pretty sure that’s everything you need for a family-friendly fourth of July. Father’s Day has been a national holiday in the USA since the 1970’s. But did you know that the very first Father’s Day was actually a one-time event held in 1908 to remember the lives of men lost in a West Virginia coal-mining disaster? The following year, the daughter of a widower (one of six children raised by him), took on the task of establishing the equivalent of the Mother’s Day holiday for their male counterparts. This was met by some resistance by men who thought the idea too sentimental, and also by those who believed it to be a commercial enterprise. Nevertheless, Washington State adopted the idea and held the first statewide Father’s Day in 1910 and it was President Richard Nixon who declared it an official holiday in 1972. Glacier National Park is paradise for Dad – whether he’s into fishing, hiking or enjoying the taste of the local brewers and distilleries. If your Dad is no longer with you in person, the mountains and forests are a great place to honor his memory and get in touch with your spiritual side without the distractions of everyday life. Come on in and introduce us to your Dad, or share your favorite stories of him with us. 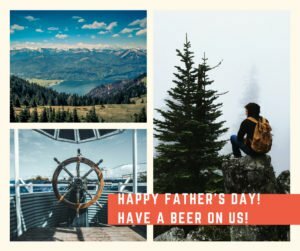 We’ll give every Father a free beer of their choice on us with their meal out of love and respect for all that our Dads and father-figures have done to shape us, support us and guide us through life’s peaks and valleys.